Many years ago I started out my calling using a 12g but having watched lots of footage of predator calling main on calling Coyotes it wasn't long before I wanted to take on the extra challenge of trying to take some Red foxes with the rifle. Not ever having much of an issue getting them in close I knew with a head shot the 22 would do the the job but in time I moved up to a HMR that not only added more knock down even reasonable for the occasional chest shot but extra range over the .22. I still enjoy the 12G but when like an instance I had today you get SITTERS that holds up out at ranges well beyond the SHOT GUN and it's there that the rifle shows its value. Here, this time of year Red fox turn their attention to finding a mate so getting them to come to a call is a battle. Not far from home I have a spot that rarely disappoints and today it produced again. Last year around this time I managed to call in a pair in there but late this afternoon armed with the HMR I only aroused the attention of one. A vixen, but she never came in and only sat just out from her lair picked her up scanning through the scope after not seeing any action for some time after some calling. I don't think she had made me out but she wasn't shifting. At 67 paces I had a steady rest and after cranking up the power on the scope I placed the cross hairs on its head and I gently squeezed off the shot. A clean kill was the result. I continued calling but un like my previous sucess there on the last visit nothing else showed. A nice health furred up Vixen and with the best white tipped tail I've seen. It was a good outcome and highlighted the advantage of the rifle over the shotgun. I just need to be able to hit running targets with bullets rather than cartridges. Nice red, rifle and shotguns both have their place. 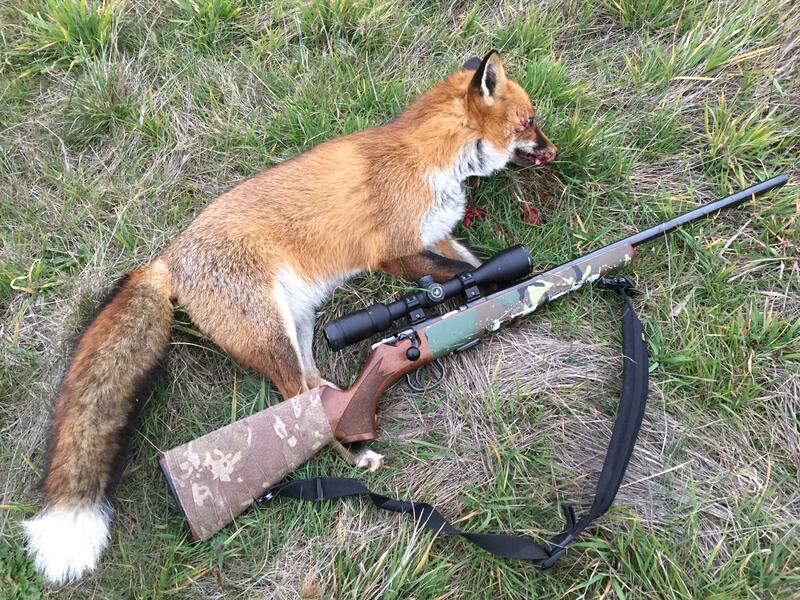 Nice looking fox. Congrats on your hunt and thanks for sharing. Thanks for sharing and the picture. I know we all see where people argue over best calibers but we all know it comes down to good shot placement most of the time. That's it. Its not caliber, its shot placement and bullet construction.